A non hazardous powdered parts detergent for use in industrial parts washing cabinets. Parts Brite is safe on soft metals, phospate free and biodegradable. This product contains defoaming agents, rust inhibitors. 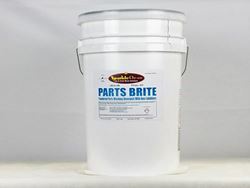 Add 1 pound Parts Brite for every 5 gallons of water.